Healthy Vision Month, NASA's One-Year Mission investigators are peering into their new findings to help address astronaut vision issues. 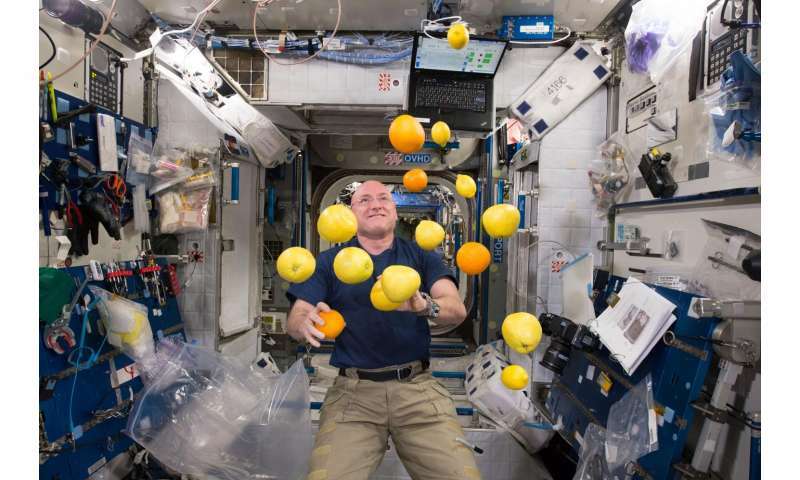 While the One-Year Mission has concluded for retired astronaut Scott Kelly, NASA's Human Research Program is focusing on comparing previous six-month mission findings to One-Year Mission preliminary findings. Typically, physiologists and scientists study one system at a time, but nutrition is a cross-cutting science with impacts across systems biology. Smith emphasizes the importance of studying the human body holistically, which is why his team has led the effort to create a biochemical database making it more efficient to interface with other researchers, such as the 22 other One-Year Mission investigators. Another investigator who works with Smith at NASA's Johnson Space Center is Michael Stenger, Ph.D. He is the Cardiovascular and Vision Lab lead and principal investigator for the Fluid Shifts investigation, which is an international experiment designed to determine the relationship between headward fluid shifts and ocular structural changes. Spaceflight Associated Neuro-ocular Syndrome, or SANS, is hypothesized to be caused by blood flow toward the head due to lack of gravity, resulting in changes to eye structure and possibly vision changes. This headward fluid shift may be responsible for vision changes, flattening of the eyeball and swelling of some tissues in the back of the eye and engorgement of the optic nerve sheath seen in approximately one out of three International Space Station astronauts. The One-Year Mission was a great opportunity to see if vision changes occurring during six-month missions continued and worsened when the mission is extended to a year. Stenger could also see if astronauts who did not have vision issues at the six-month mark, developed them when extended to one year in space. The preliminary findings are a bit of both. One subject developed SANS early in the mission and had some symptoms worsen as the mission lengthened while another did not. The subject who did not experience SANS symptoms during the first six months of flight did start to show some changes near the end of his year in space, suggesting that length of time in space may impact the eye. Both Smith and Stenger are working together to solve eye and vision problems for astronauts. They agree their investigations are just scratching the surface and there is a lot of work that still needs to be done on the ground and in space to validate theories. While Scott Kelly returned to Earth in a healthy state, NASA continues to keep its vision focused on sending humans safely and effectively on a three-year journey to Mars.